You've been to the stores in the past couple weeks, I'm sure. And one of the frustrating parts of this time of year is all the Christmas stuff that just seems to be out earlier every year. I'm not ready for Christmas. Don't get me wrong. I love Christmas music. I love Christmas food. I love church at Christmas time, especially a Christmas Eve service. I love the emphasis on "peace on earth, good will to men." I love the chance to talk about Jesus and why He had to come. As a blog reviewer, I totally understand that I'll be in a position to deal with Christmas earlier than I'd necessarily choose to. Like checking out a Christmas CD, a Christmas DVD, or a Christmas devotional (watch for those over the next couple of days). 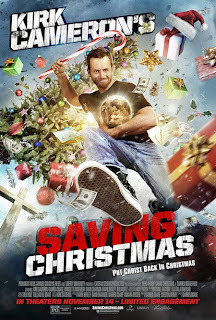 I'll confess that I put in to review Kirk Cameron's Saving Christmas because my husband and teens were interested. I read them the description and they thought it sounded good. I had looked at the cover, and thought it looked crazy. And not something I wanted to watch. Seriously, who wields a candy cane like a sword? And why would I want to watch? "Put Christ Back in Christmas"
That was the line that made me willing to do this. I like a Jesus-focused Christmas. So we sat down to watch via a special online screening, and we were able to watch all but the last 2-3 minutes. Something glitched, and it is one-time thing, so we couldn't get it back. So we missed the final summary. We did enjoy the viewing though. I'm not sure how to describe this, except it was really what I expected. In a good way. Basically, Kirk's sister is throwing a huge Christmas party, and her husband is uncomfortable with all the trappings -- gifts, trees, Santa, Jesus wasn't born in December, etc. -- and he and Kirk have a big, long conversation about the origins of some of these things. Only Kirk's side of the conversation usually involves people acting out the story. Most of that was entertaining, informational, and thought-provoking. Connor (17) commented that this went deeper than most "Christmas apologetics" he's seen before. Santa coming from St. Nicholas wasn't the story of him dropping dowry money into the stockings of three unfortunate sisters (it was sort of assumed you already knew that story though) but it talked about Nicholas as a bishop, and the First Council of Nicaea. You know, where they hammered out the Nicene Creed. There were a couple things that bothered me, maybe because of my work with food pantries and food shelves. Since we only got to see this once, I didn't get the exact quote, but at one point the brother-in-law is talking about all the money spent on gifts that are played with for a month and then ignored, and asking how many people (children?) could we feed with that money. Or how many wells could be dug? The answer had to do with how our Heavenly Father likes to shower gifts on his children, much as we like to give gifts to our kids. And while I do agree with that to a point, I also think that it rationalizes greed and selfishness. I want to buy the biggest, best, coolest toy ever. And I can justify it because God wants me to have blessings too. Meanwhile, seriously, how many families could you feed instead? Or how about toning down the gifts just a bit and going out and blessing some of the least of these? Or if you are talented at throwing parties, why not call a homeless shelter or food pantry and see about throwing a party there? Okay, so that is me going off on a tangent, I know. So back to Saving Christmas. One statement Kirk made was how we need to take a look at these Christmas symbols and traditions, and that "you just need to see it with new eyes." There definitely are things I will be looking at differently, like Christmas tree lots, and the swaddling cloths. Saving Christmas is in theaters starting tomorrow, November 14, for a two-week limited run. I love the idea of seeing a real defense of how Christmas is really about Christ on the big screen. I think the biggest take-away for me was the idea of taking some of these symbols and traditions and using them to point back to Christ -- even if not quite the way Kirk does. Disclosure (in accordance with the FTC’s 16 CFR, Part 255: “Guides Concerning the Use of Endorsements and Testimonials in Advertising”): Many thanks to Propeller Consulting, LLC for providing this prize for the giveaway. Choice of winners and opinions are 100% my own and NOT influenced by monetary compensation. I did receive the opportunity to view a screening of the product in exchange for this review and post. It's playing here and we are planning to go on Tuesday (if I feel better). I'll let you know what I think. My husband, who NEVER sits down with me to review Christian movies, sat through the second half of this and was impressed.